You’ve recently become the proud owner of a new tennis court. Now what? Tennis courts require maintenance no matter the surface type. It is important to take good care of your court now to avoid expensive problems in the future. Here are some simple guidelines for looking after your tennis court surface and ensuring that it remains in top condition for years to come! 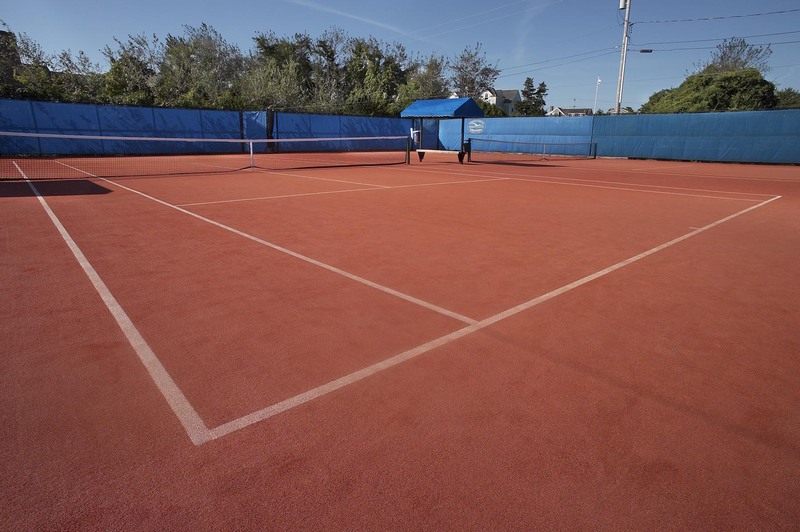 If you have a clay tennis court, remember to remove the debris, dust and dirt with a blower. During the summer season, it is important to water the tennis court regularly so as to prevent formation of cracks. These kinds of courts require everyday maintenance so make it a point to roll the surface with a court rake every morning. Use a line broom to clean the tapes. This will also prevent the growth of unwanted weeds, fungus and algae. In the rain, make sure your terrace court is covered to avoid damage to the surface and use an agricultural moss killer to get rid of the moss after the wet season. Grass courts require constant maintenance. While grass courts might be aesthetically pleasing, you should know that they require time and effort. To increase the life of your grass court, make it a point to mow your tennis court regularly. Mow the lawn at least once a day to keep the smooth and ready for game play. Use a steamroller to make sure the tennis surface is firm and solid. Water and fertilize the grass to help the grass stay green and healthy. 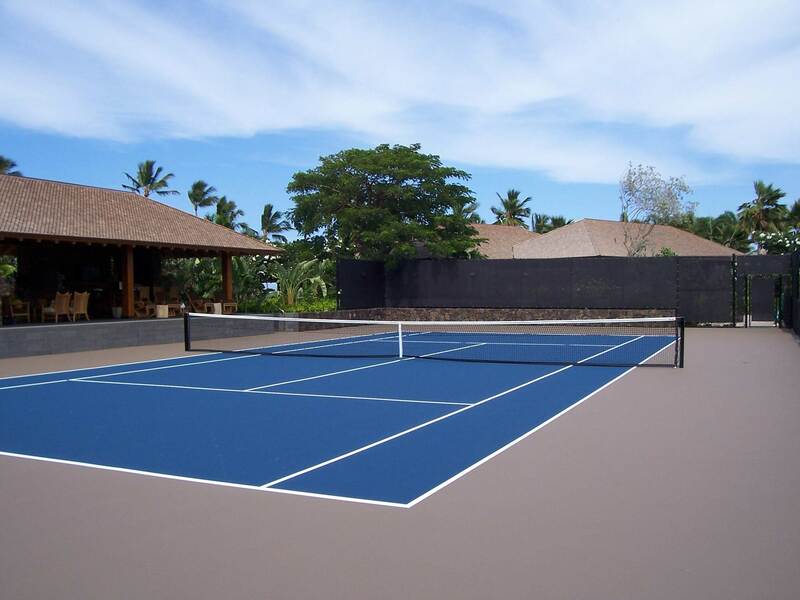 Acrylic tennis courts require very little maintenance as they are very durable. However, by ensuring a clean court you’ll prevent troublesome problems in the future. When possible, keep the surface clean and dry. Regularly sweep the surface to keep it free of dried leaves, dirt twigs, and spilled food. Accumulated dirt, debris, gravel, twigs and bird droppings can lead to deterioration. Keeping your court clean is especially important before the winter months in areas that expect snow. Make sure the court is clear of leaves and debris before winter sets in. Spilled food could lead to mold and mildew. If you do notice mold and mildew, use a mixture of 4 part water and 1 parts bleach to gently scrub the affected area. If stains are visible, gently scrub it off using a mild detergent and a soft bristled brush. You can always clean your acrylic surface with a mild detergent as a precautionary measure once a month. Check your court monthly for standing water and puddles. You can do this after a rainstorm or by flooding the court yourself. If puddles do appear it is a sign of shifting and deterioration in the court. 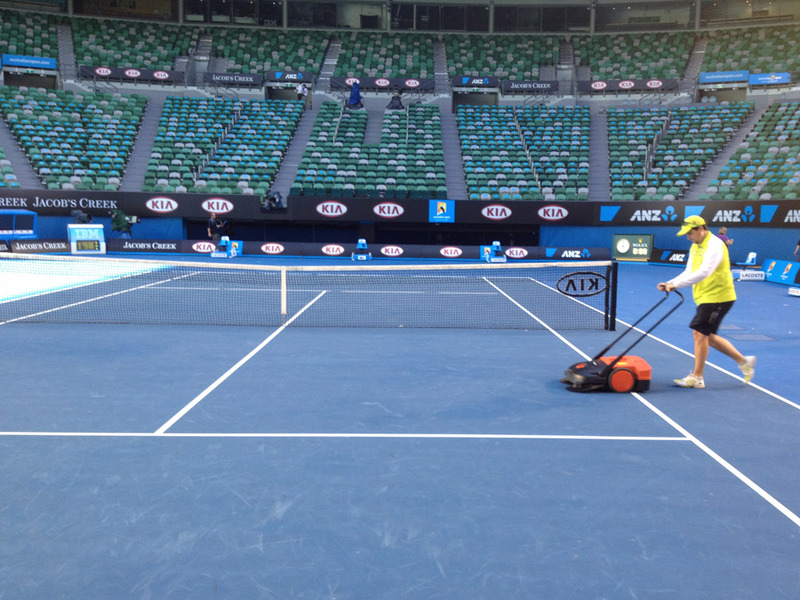 Always make sure the court is dry from rain or cleaning before play begins. 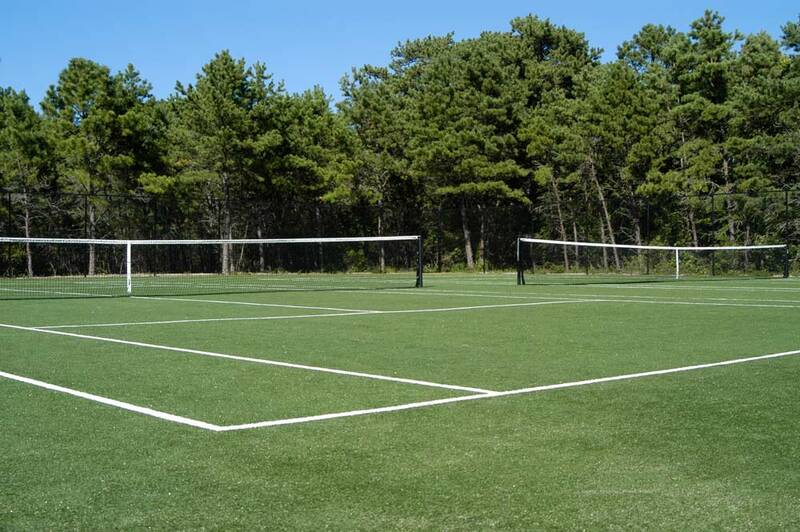 By developing a regular schedule for tennis court maintenance, you’ll be able to catch problems before they progress. For a more detailed guideline of tennis court maintenance and suggested maintenance equipment please visit Plexipave’s or DecoTurf’s websites.